I am thrilled beyond belief to be sharing an amazing new book with you today written by none other than Angela Watson of The Cornerstone for Teachers. 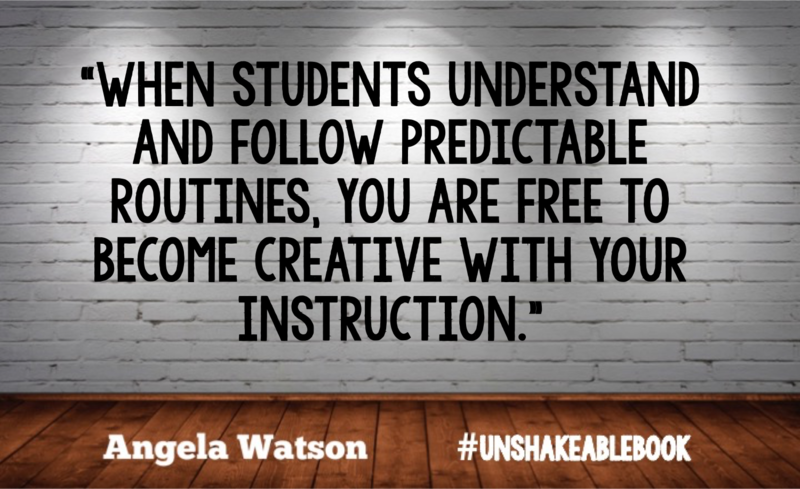 Her new book entitled Unshakeable: 20 ways to enjoy teaching every day... no matter what is simply brilliant and I cannot wait to share my thoughts on Chapter 14. If you haven't had the opportunity to delve into Angela's work, I highly recommend her blog as a fantastic place to start. She has a wonderful way of combining practical, student (and teacher! )-friendly practices in a way that also inspires and challenges. Her voice shines through in a way that she is instantly relatable but also thoroughly knowledgeable and there are so many takeaways, it's hard to know where to start! I have been teaching for ten years and this chapter title sang my name loud and clear when I read it: Construct a self-running classroom that frees you to teach. Ahhhh! If there is one thing that I try to cultivate from the get-go each year, it's this! I am sure we are all too familiar with teachers that don't, or even years when we've put this task on the back-burner... and subsequently paid the price as the year continued. So I knew this chapter was an important one! Angela stresses predictable routines... no.matter.what. YES! There are rarely "routine" days in the classroom, but the dedication as teachers that we show to the predictable routines we have taught can make all of the difference in our energy level and the level of learning we are able to accomplish in our classroom throughout the year. For example, in my own classroom, Morning Meeting happens no matter what. Regular days, testing days, field trip days.... we sit in an oval when the bell rings and have our meeting. It's familiar, it's student-led, and it gets us off on a predictable and positive note for the day. Because your time isn't spent organizing the tiny details of the daily routine, you have more energy and more brainpower to be able to incorporate some really amazing lessons! Now, both you and your students to become more creative and inspired within the systems you have in place. Not sure where to begin? She has loads of "use tomorrow" techniques that I know there will be something that will easily fit your style and boost your confidence. I even began a few the next day and was amazed how quickly my students adjusted to the new phrases or tips I was using, without any prompting or long discussion by me. There's a beauty in reading a well-written book by someone who is not only passionate, but has been in the classroom and has done what we've done. You can always, always tell a difference, and this book gives real teachers real solutions. 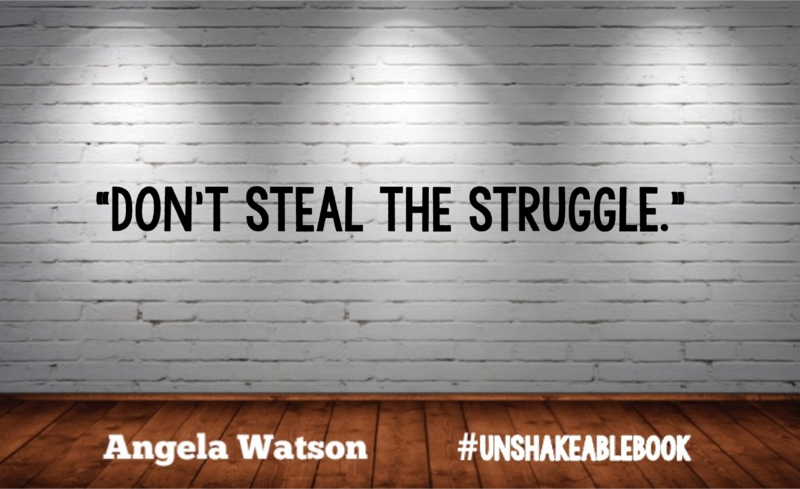 One of my most favorite thoughts to take away, especially this time of year is, "Don't steal the struggle." When you truly move to a more student-run classroom, there will be more thinking, more reflection, and more struggle.... don't take that from them. This is, admittedly, a challenge for me. I like to keep the pace moving and I like to insert all of my wisdom (ha!) when I feel it's needed. Angela reminded me that in order for my classroom to truly be filled with learners and leaders, I need to take a step back and watch as they work to come to their own answers and solutions. This practice has helped me slow down with these end-of-year expectations and has allowed for my small groups to go more in-depth with something that may not be "test-worthy" but is much more "life-worthy." And isn't that what's most important, after all? She ends the chapter with a set of self-reflection questions for you as a teacher. These really challenged me to look at my own procedures and see where I am still clinging to the need for control, often unnecessarily. I cannot recommend this book enough. Either for the veteran teacher, as a way to inspire and breathe fresh air into current routines, or for the new teacher as a way to get off to a very strong start, or for those of us in the middle who are still tweaking and adjusting as we go.... there is something for everyone in Unshakeable. 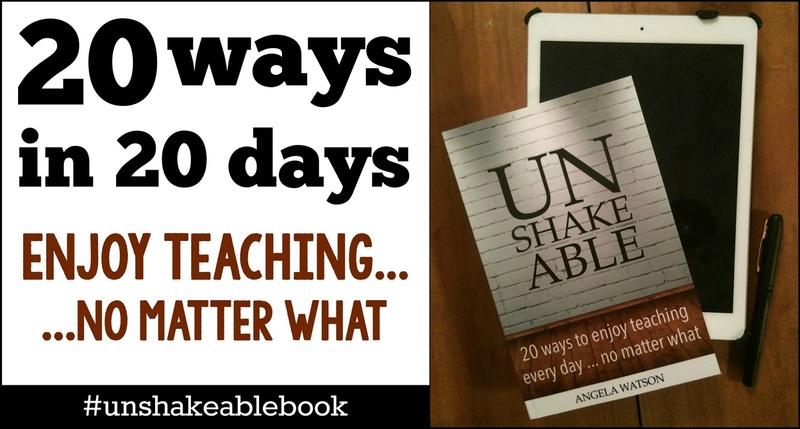 Read more about the 20 ways from Angela's book HERE and learn how to get your own copy HERE. Thanks for your recommendation. Just got the Kindle version thanks to your thoughtful post. Stephanie, I'm so glad to hear you enjoyed this chapter! I love your reflections on not stealing the struggle from kids and going "more in-depth with something that may not be 'test-worthy' but is much more 'life-worthy'." Thanks so much for writing this.